Will Angelina Jolie run for office? The Hollywood star pondered her future as she guest-edited BBC Radio 4’s flagship Today programme. She told presenter Justin Webb she “can take a lot on the chin”. The Oscar-winner, 43, replied: “If you asked me 20 years ago I would’ve laughed. I really don’t know. I always say I’ll go where I’m needed. I don’t know if I’m fit for politics ... but then I’ve also joked that I don’t know if I have a skeleton left in my closet. Jolie, a special envoy for the UN’s refugee agency, the UNHCR, added: “Right now, I am able to work with a UN agency ... to do a lot of work directly with the people in need. She laughed as Webb suggested she could be on the list of 30 to 40 Democrats running for the party’s presidential nomination. That’s definitely not a no. And she’s right about the skeletons. It’s not like she’s never been on the cover of a tabloid. Going from the dirty world of celebrity to the dirty world of politics might not be that much of a stretch for her in that she already has a thick skin and “can take a lot on the chin”. Does that mean Angelina Jolie is going to run for president? I don’t think so? At least not in 2020. Beyond that though? If we were to even entertain this, like purely hypothetically, what path would she take? Would she run for Senate or even for governor (of California?) first? Or would she aim straight for the White House? Again, this is a hypothetical. A game of What If? How do you see it? Here’s Angelina running errands yesterday with a couple of her kids (not pictured). 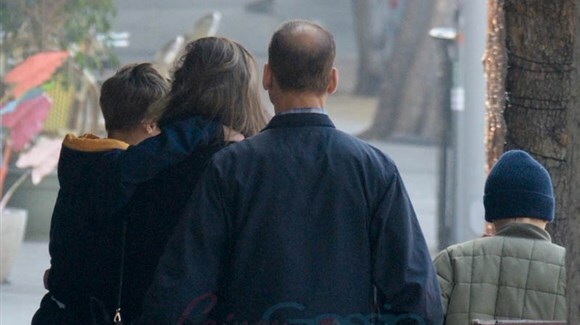 Also here’s a shot of Angelina from behind after taking her kids out for breakfast. Shiloh is the one with her arm around Angelina’s shoulders in the yellow hoodie. The reason I’m including this is to make the point that Shiloh is now tall enough to put her arm around mother’s shoulders. At 12 years old, she’s almost as tall as her mother. It goes by so fast.